"Laser" is an acronym for lightwave amplification by stimulated emission of radiation. Lasers exploit the fact that electrons in atoms' outer orbitals can move between energy levels. Like a marble being shifted up and down a set of stairs, an electron can be raised to a higher energy level by giving it the right amount of energy or can give up a fixed amount of energy when it drops to a lower level. The energy given up when an electron drops to a lower level is emitted as a photon (minimal unit of light); the greater the energy lost by the electron, the shorter the wavelength of the emitted light. If the electrons in a material happen to be undergoing energy shifts corresponding to wavelengths that our eyes can see, the material is seen to "glow." 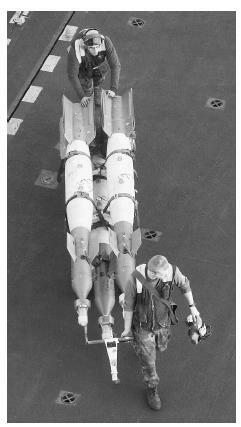 U.S. ordnance handlers haul a rack of GBU12 laser guided bombs along the deck of the USS Theodore Roosevelt in the Arabian Sea in 2001.
emitting photons at random moments and in random directions, independently of each other. In a laser, however, a chain reaction or domino effect occurs. The electrons in a sample of some substance, for example, a cylinder of gas or a cylindrical crystal of artificial sapphire, are first fed energy—"pumped" to high energy levels. (Pumping was accomplished in all early lasers by illuminating the laser's working substance with intense light, hence " lightwave amplification" in the acronym.) If enough of the atoms in the substance are in the excited state to begin with, a domino effect can begin when one atom emits a photon. This photon impinges on a nearby atom, causing it to release a photon having the same frequency, direction, and phase. These two photons go on to stimulate other atoms, which stimulate others, and so on. The result is that most of the energy locked up in the excited electrons of the laser's working substance is turned quickly into a burst of coherent light. A substance undergoing this process is said to "lase." The resulting light pulse, which is aligned with the long axis of the sample of lasing substance, can be very intense. Lasers that beam continuously, rather than pulsing, can also be built; the trick is to devise a means of continually reexciting the electrons in the lasing substance as their energy drains away as laser light. Laser light has several important characteristics: (1) It forms a tight beam, that is, a beam that spreads only slightly with distance. (2) It can be very bright: it is commonplace for a laser to be brighter than the surface of the sun. (3) As all the photons in a given laser beam are produced by identical electron-orbital changes, they are all of the same frequency. That is, a laser beam is of an extremely pure color. (4) Because laser light is coherent, slight shifts in the frequency of laser light, such as those caused by the Doppler effect, are easy to detect. Also, light from a single laser source can be used to interfere with itself after following different paths to a common destination, allowing the extremely precise measurement of distances by the technique termed interferometry. Laser-guided weapons. The distinctive character of laser light—its coherence, brilliance, and purity of color—enables it to stand out from its surroundings, even during broad daylight. Thus, it is easy for a missile to home in on a target (e.g., tank or building) that has been "painted" or illuminated temporarily by a laser beam. Munitions that guide themselves to laser-painted targets are termed laser-guided weapons. Most of the precision-guided munitions in the U.S. arsenal today are laser-guided. Missile-defense lasers. Beginning with the Star Wars program proposed by President Ronald Reagan in the early 1980s, several schemes have been proposed for using large lasers to shoot down ballistic missiles. The Stars Wars program proposed orbital laser stations or x-ray lasers pumped by nuclear bombs to shoot down ballistic missiles; these ideas were abandoned as too expensive and, possibly, too susceptible to countermeasures. However, development of less-ambitious laser-defense schemes continues. In 2003 or 2004, the U.S. Air Force hopes to perform the first missile-shootdown tests of its YAL-1A Airborne Laser system, a powerful laser mounted on a modified Boeing 747 jetliner. LIDAR. LIDAR (light detection and ranging) is analogous to radar (radio detection and ranging), but has capabilities that radar does not. In its simplest form, it measures the distance from a laser transmitter to a reflective object by measuring how much time it takes for a laser pulse to make the round trip. Doppler LIDAR, like doppler radar, deduces the velocity of the target by measuring the frequency shift of the echo. LIDAR can also measure the composition of distant reflectors by sending paired laser beams having different frequencies; differing absorption by the substance reflecting the beams (e.g., smoke particles) reveals information about the chemical composition of the target. LIDAR is used by low-flying stealth aircraft to track terrain ahead of them; unlike conventional radar, LIDAR illuminates a very small area of terrain and so is difficult to detect. Virtual retinal displays. A virtual retinal display shines low-powered lasers mounted on a headset directly onto the retina of the human eye. The display lasers—one for each primary color—are directed at scanning mirrors that rapidly scan the lasers over the user's retina. (The eyes' own movements are tracked in real time and compensated for by a computer.) The scanning occurs so rapidly that the user perceives a solid image, not a moving dot of light. Virtual retinal displays have the advantage that they allow the user to see normally at the same time; the image produced by the virtual retinal display is superimposed over whatever else the user happens to be looking at. This can be a boon to pilots, allowing them to receive information from electronic sources without having to look away from their flight environment. "Lasers: Spontaneous and Stimulated Emission." Kottan Labs. 2001. < http://www.kottan-labs.bgsu.edu/teaching/workshop2001/chapter4a.pdf > (April 18, 2003). "Virtual Retinal Display Technology." Naval Postgraduate School, Department of Computer Science. September 15, 1999. < http://www.cs.nps.navy.mil/people/faculty/capps/4473/projects/fiambolis/ rd/vrd_full.html#VRDworks > (April 18, 2003).